A sinkhole that appeared Thursday in Pacific Heights, San Francisco, is undergoing repairs. 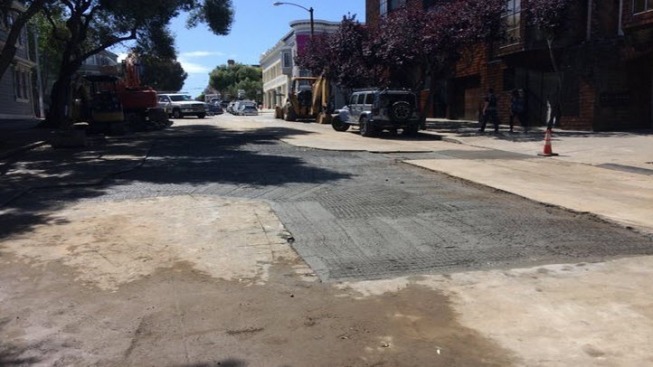 On Saturday morning and afternoon, crews poured concrete in the giant 17-foot by 22-foot crater on Sacramento Street. By about 5:30 p.m., the street had reoped to traffic. The sinkhole appeared between Lyon and Baker streets around 5 p.m Thursday, causing major traffic delays and road closures. At the time, it was estimated to take two or three days to fully repair. The incident appears to have been caused by a sewer main break at the same location, although the cause of the break is not yet known. Water and sewer service has not been affected, according to the San Francisco water department.